The results of a five-year study conducted by the Iowa Learning Farms, Iowa State University Extension and Outreach and Practical Farmers of Iowa, reinforced that cover crops added to a corn-soybean rotation have no negative effect on yield and result in statistically significant reductions in nitrate concentration in subsurface water. The details of the study are included in a brand new infographic now available for download. 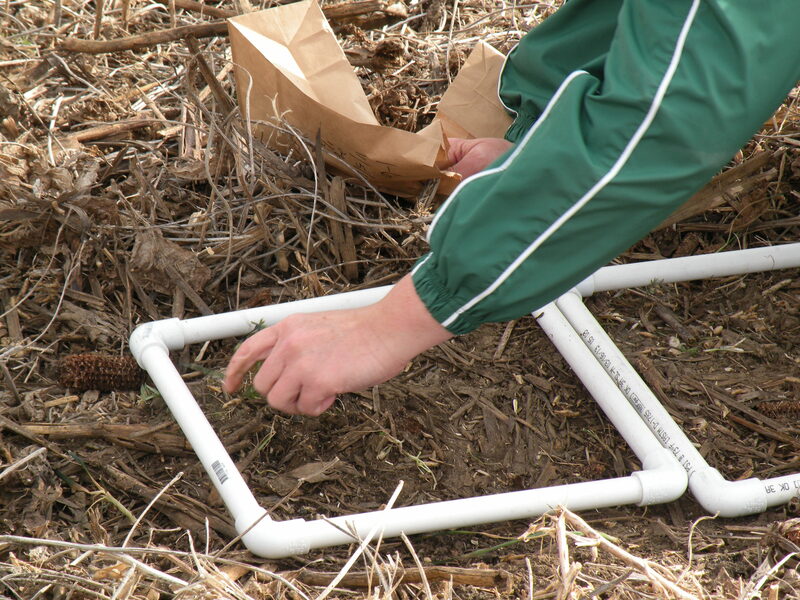 Throughout the 22 site-years of yield data, there was no significant difference in cash crop yields between control strips without cover crops and those planted with cover crops. Is it important to note that planter settings may impact yield if not properly managed to accommodate residue from the cover crops. Iowa soils are highly vulnerable to nitrate losses between April and June when natural nitrate production exceeds typical crop demands. The analysis of water samples from those three months, showed a statistically significant reduction in nitrate concentration in the cover crop strips. We are really excited to see this significant reduction in nitrate concentration when cover crops are present, as addressing nitrate levels is a key component to reaching our Iowa Nutrient Reduction Strategy goals. Since this project had locations located throughout the state, we were able to see how the different cover crop species performed in different soil regions and weather patterns. We observed consistent establishment and biomass production of the rye and oats at all sites and gained the largest reduction in nitrate concentration from those single species treatments. Rye and oats provided the most biomass and had the lowest cost of establishment, helping make them the top choice for cover crops in Iowa! The infographic is available online at the ILF website. Funding for this study was provided by NRCS Conservation Innovation Grant and Leopold Center for Sustainable Agriculture. Back in the seeding saddle again! We were busy last week seeding our cover crop mixture project sites for the sixth year. We are continuing the plots at three of our sites to take a closer look at the common nightcrawler, Lumbricus terrestris, as a biological indicator of soil health. Between the storms, we were able to seed oats and a mixture of oats, hairy vetch and radish into the soybeans. We also seeded rye and a mixture of rye, radish and rapeseed into the standing corn to cover this fall but also next spring ahead of soybeans. 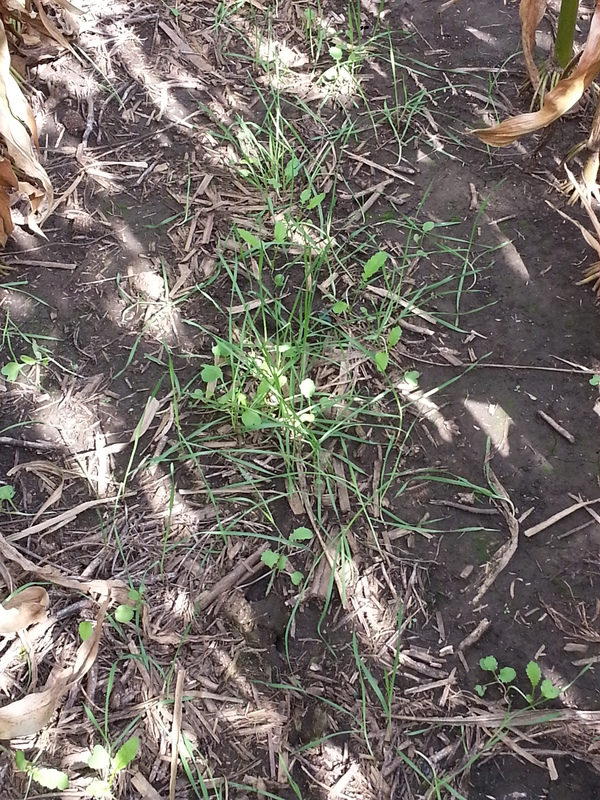 This is a perfect example of using an overwintering cover crop species like cereal rye to #CoverYourBeans! Many thanks to Emily Waring, Taylor Kuehn and Maddie Tusha for all your help! Labor Day often marks the end of summer, but for the Iowa Learning Farms team it’s the start of cover crops season! Last week we traveled across the state to seed our cover crop mixture project sites. The project began in 2013 with hand broadcasting seeding cover crops at six Iowa State University Research and Demonstration Farms. In 2016, we continued the project at four sites and this fall marked the fifth and final year of seeding. But first some background – to seed the research plots we prepared individually weighed seed packets to help achieve an even seeding rate of roughly one million seeds per acre. These are labeled, bundled and packaged by site to maximize efficiency in the field while seeding. Once we arrive at the research farm, we carefully double check the map and add orange stakes to mark the first row of each plot. I then load up my nail apron with the packets for one of the plots and prepare to seed. A teammate holds the end of our tape measure and I grab a hold of the other end. I then tear open a corner of the packet and walk backwards shaking out the seed. Once the nail apron is empty, we check the map and move to the next plot. Here’s a peek at seeding into corn at the Lewis Research Farm in southwest Iowa. So how many miles did I cover walking backwards while seeding? Each site had 16 cover crops plots that were 50 feet in length. The width ranged from 6-12 rows. All told, in the last five years I have walked 30.6 miles or 61,200 steps backwards seeding cover crops. In the span of four days last week, our team traveled 975 miles to seed the cover crops and collect the lysimeter water samples. 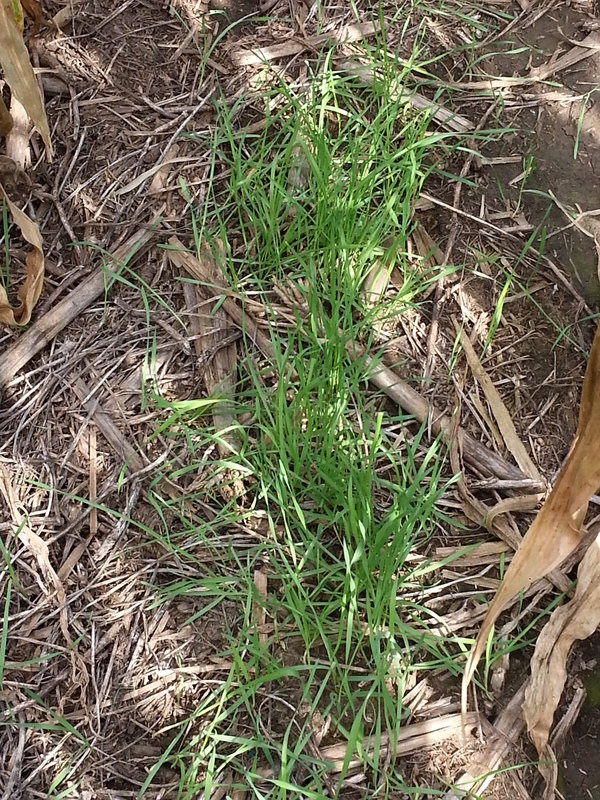 This year offered incredible weather to get the cover crops seeded and it was bittersweet to shake out the last packet of seed – oats – into the soybeans at Kanawha. I am also pleased to announce that I did not fall into the badger holes at our site in southwest Iowa – fifth year is the charm! To everyone who helped establish the plots, the farm managers at the research farms and farmer partners for collecting biomass samples, yield data and management information, the pilots that flew on the cover crops, our outstanding summer interns and the team at Iowa Learning Farms – Thank You! Stay tuned for an upcoming project report summarizing the great information this project has yielded. The Iowa Learning Farms team has been busy in the last few weeks seeding our cover crop demonstration sites across the state. Now is the time to seed if you want to seed into a standing cash crop prior to harvest. Seeding into a standing crop will allow the cover crop to establish and will provide more benefits prior to winter. Aerial seeding, overseeding, and broadcast seeding work well for seeding into a standing crop. You can also drill cover crop seed after harvesting your cash crop. We seeded our test plots using hand broadcast seeding. Hand broadcast seeding is a great option if you have a small amount of space to seed. It’s especially useful if you’re just getting your feet wet with cover crops and want to test out a strip or small area in your field. We weigh our seed ahead of time so that we can seed at a rate of one million seeds per acre. Each envelope shown here will seed one 50 foot row in our test plot. 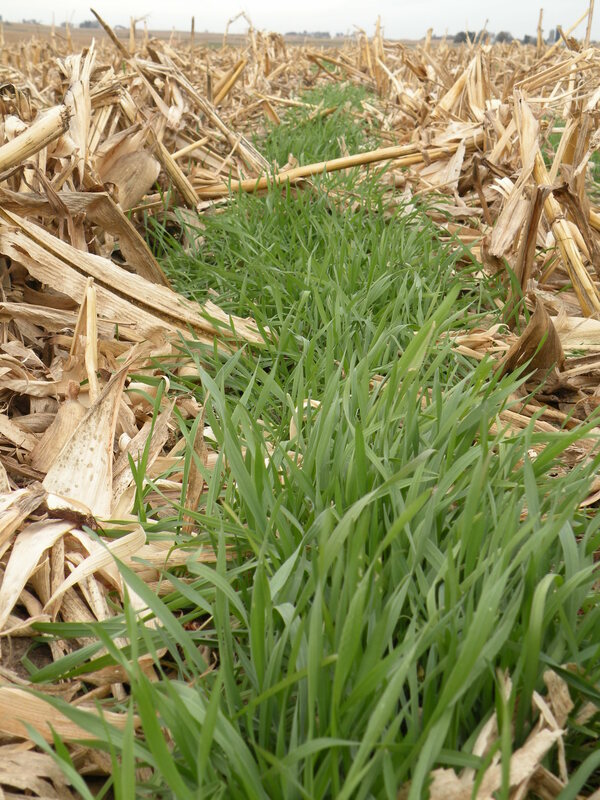 For seeding rate guidance, see our Cover Crops in Iowa Seeding Rate Guide and Cover Crop Seeding Rate Calculator. Our test plots have a corn/soybean rotation. For plots currently in soybeans that will be going into corn, we seed single species oats, a mix of oats with radish and hairy vetch, or no cover crop.For plots currently in corn that will be going into soybeans, we seed single species rye, a mix of rye with rapeseed and radish, or no cover crop. In the field, we seed 50 foot rows by hand. One person holds a tape measure and stays at the beginning of the row. Another person takes the end of the tape measure with them and walks backwards, using a consistent shaking pattern to distribute the seed evenly throughout the 50 foot row. Seeding ends when the tape hits 50 feet. Liz has perfected that consistent shake over the years. We seed all of our plots in this way, traveling up and down the rows. We hope that these fields will green up just like they have in past years. This is our fourth year seeding cover crops at these locations. Check out our results of the project so far with this publication from the Northeast Research Farm. ILF’s August Webinar features none other than Tom Kaspar, Plant Physiologist at the USDA-ARS National Soil Tilth Laboratory in Ames, IA and USDA Collaborator/Professor with the Agronomy Department at Iowa State University. 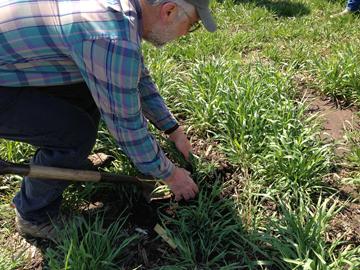 Tom Kaspar digs up some of the cover crop roots in his long-term research plots. Tom discusses his research on Cover Crops in terms of their proven benefits, such as erosion control, soil health, and reduction in nitrate loss. But Tom also reminds us that we have just scratched the surface of our knowledge, pondering the possibilities of better adapted species, further experimenting with mixtures, and a better understanding of the precise effects upon yield. 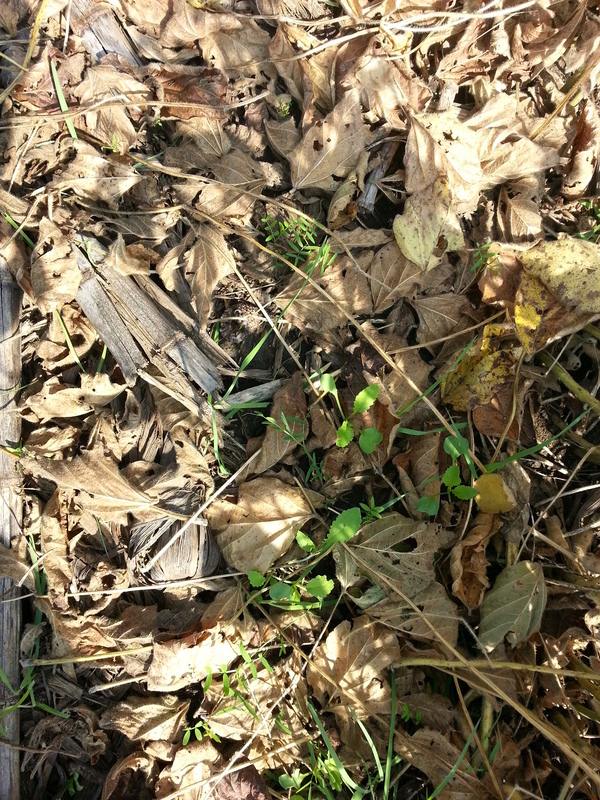 You can also read about getting started with cover crops and if you missed Tom Kaspar on the Conservation Chat, listen here! Check out the ILF June Webinar featuring Sarah Carlson, Midwest Cover Crops Research Coordinator at Practical Farmers of Iowa. Sarah provides a great update to ongoing cover crop research in Iowa including: variety and mixtures trials, planting date trials into seed corn acres, and results from years 5-6 of the joint ILF/PFI long-term rye cover crop project. More detailed information about each of the studies can be found here. At PFI, Sarah helps promote agronomic research about cover crops through articles, blogs and presentation materials while working to improve the support for cover crop research. She also serves as an agronomist, transferring ideas for solutions to integrated crop and livestock concerns from farmers’ stories, results from on-farm research projects and her own knowledge as a trained agronomist. Watch the recorded June Webinar any time. The link is found on the webinar page on the ILF website. In fact, links to all of our 53 webinars are found here! 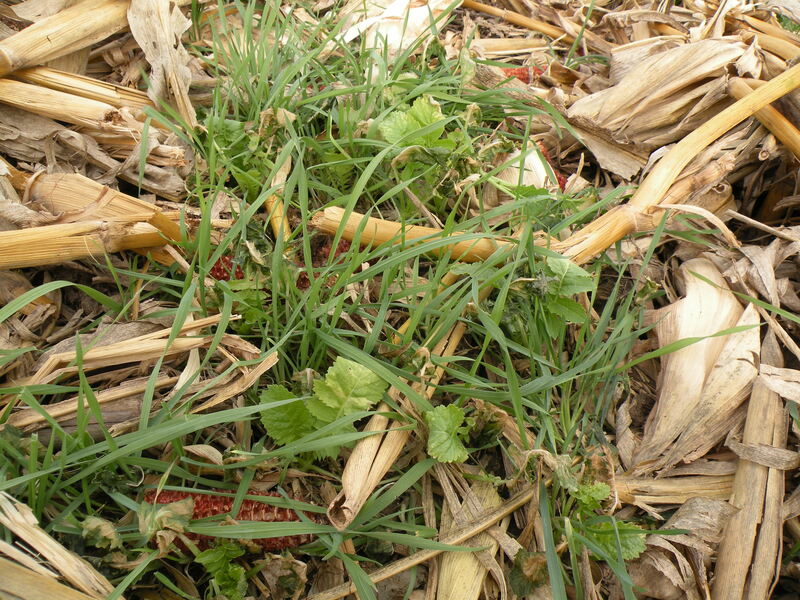 For a bonus cover crop webinar, watch the archived presentation on Application of Cover Crops in the Midwestern U.S. from the North Central Region Water Network’s The Current webinar series. The webinar features Dean Baas, Senior Research Associate, Michigan State University Extension; Tom Kaspar, Plant Physiologist, USDA-ARS, National Laboratory for Agriculture and the Environment- Ames; and Matt Ruark, Asst. Professor and Extension Soil Scientist, University of Wisconsin-Madison. Over the last two weeks, Iowa Learning Farms team members (with help from our friends at Practical Farmers of Iowa) have been visiting ISU Research and Demonstration Farms statewide, checking up on our cover crop mixture plots planted as part of the National Conservation Innovation Grant. 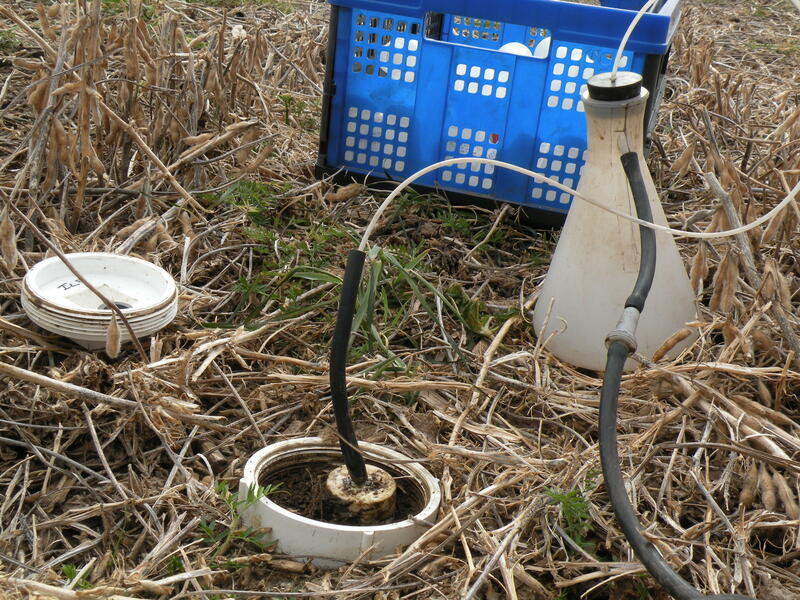 Our visits to the six sites include collecting fall above-ground biomass from each of the cover crop plots, the final water sampling of the season, and winterizing the suction lysimeters until sampling resumes in spring. And how about those mixtures? Biomass Sampling in Progress: All cover crops within the quadrant are cut at ground level, collected in bags, and brought back to ISU for analysis to determine the amount of cover crop growth (# biomass/acre) and well as total carbon/total nitrogen content of the cover crop biomass collected. Biomass is collected in the fall (as close to hard freeze as possible) and in the spring (as close to termination as possible). Want to learn more? Join us for one of our upcoming November field days! 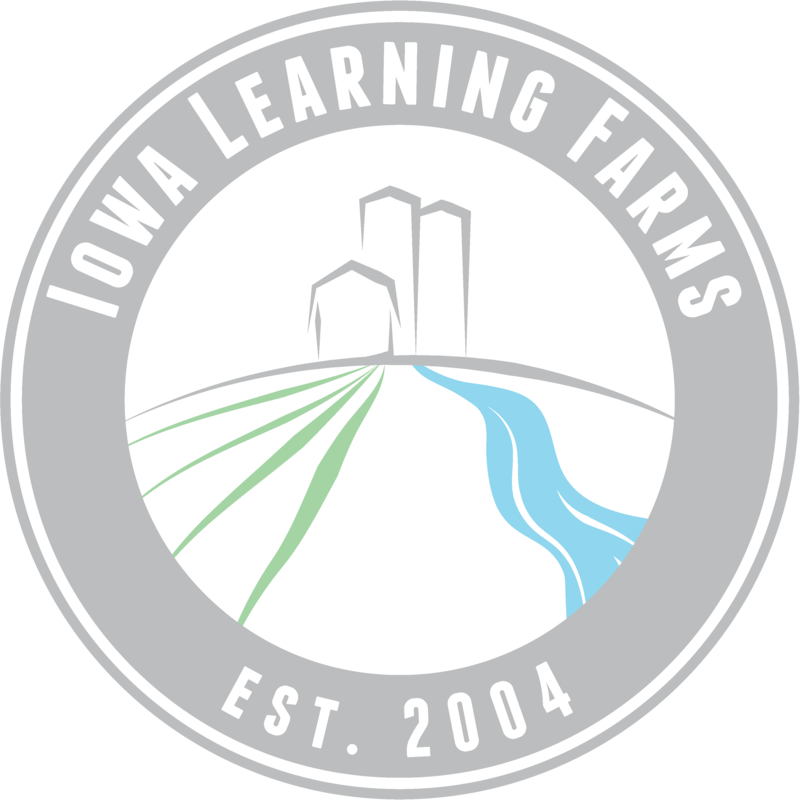 Detailed information for each is available on the Iowa Learning Farms website. Rob Stout farm, Washington Co.
Truro Lions Club, Madison Co.